Please check the stock status on the website. We update our stock status daily and try to keep it real time. If an item is out of stock and we have an estimated date of arrival (ETA) that is a good indication it will arrive at or around that date, otherwise we have no ETA. Having no ETA could mean months before it is in stock again. If an item is out of stock, what would be the best way to get notified when the item will be available for purchase? Please navigate to the product detail page, enter your email and click the "subscribe" button. We will then email you the minute they are in stock and ready to purchase. Sorry we cannot back order any items. What is the best way to get notified for new upcoming products? How do I get a coupon code and what are the restrictions? Coupon codes are emailed periodically throughout the year to our subscribed newsletter customers. Simply create an account with us online and sign up for the newsletter option. We may also offer coupon codes through our social media pages. See Q3 above for links. Coupon codes are only available to use for online purchases. Online purchases must be shipped. Not valid on past orders, pre-orders, or back orders. The coupon code does not work. I have problems logging into my account even after resetting my password. The site does not let me check out. My shopping cart is empty after adding an item to cart. What happened? Make sure the coupon code is used during the active promotion period. Coupon codes not working, or issues related to logging in and checking out is caused by an old or outdated web browser. Please use the most updated web browser for your desktop or mobile operating system. Are the items you sell street legal? 1. You must not remove your factory rear turn signals, they must be a minimum of 9 inches apart at the closest point (lens). I immediately tracked my package after receiving the shipment confirmation email and USPS is showing that it has already been delivered last year in a different country. I am an international customer and my package was shipped by Priority Mail International. What happened? Did I receive the correct tracking number? Lately, USPS has been reusing tracking numbers from previous years. If this affects you please allow at least 48 hours before you should track it again. In any case the tracking number will be updated when they perform the export scan. Can I install this without issues? I have installed the Sequential tail lights as per the instructions. The park and brake lights work fine but only the first and/or second columns of LEDs blink on both sides and it is blinking really fast when I activate the turn signals. What should I check for? 1) You may be required to start the bike in order for the sequential signals to work as the alternator provides additional voltage to the system. This is sometimes caused by a weak battery that can no longer hold a good charge. 2) Aftermarket LED turn signal lights are installed up front without resistors - your entire system needs to be blinking at the normal blink rate prior to the install in order for the sequential signals to work. We recommend to wire up load resistors on each of the front LED turn signals. We carry them here if you need to them of if your local electronic store carries them you will need a pair of 25W 7.5 Ohm cement type load resistors and bridge the connections on each of the front turn signals. 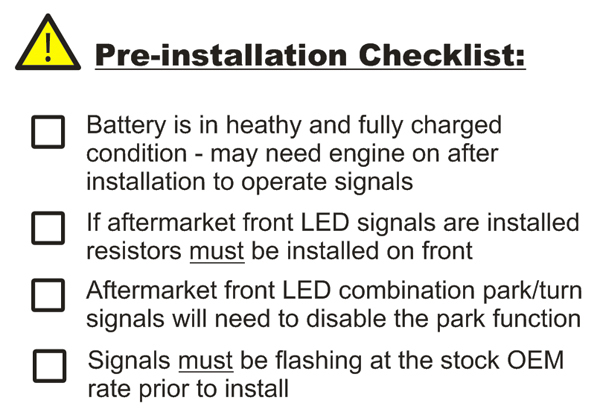 Also note if you have any aftermarket front turn signals that are dual function park/signal lights, you will need to disable the park light and run it as a straight signal light. 3) There is not enough resistance on the front signals - incandescent bulbs less than 21W are used (ie. 10W). An alternative solution is to upgrade to an electronic flasher relay. 4) There is no turn signals installed on the front. You MUST have some form of resistance in front. Either a stock turn signal, a load resistor, or an LED turn signal with load resistors will work. Is there any modification required to install this tail light? The tail light is designed as a complete bolt on with zero modifications on a stock motorcycle, but you are required to use the included sub harness to make the installation possible. Can I continue to use my aftermarket electronic flasher relay or do I need to revert back to my stock flasher relay? The Sequential system is designed to be used with your factory load style flasher relay but you will need to use the included sub harness. If you wish to use an aftermarket electronic flasher relay, it must have the same timings as your stock relay. If this is the case, the sub harness will be installed in the same manner as the factory relay. I have installed the tail light according to the instructions and only one side of the turn signal is functional. When I swap the left and right turn signal inputs, now it works but the opposite side does not work. What should I do? We've had a small number of customers run into this problem so we have addressed it here. This is a problem with the subharness and we apologize in advance if you have received one of these bad harnesses. Take a look at the subharness connectors side by side and see if the positive and negative wires are not swapped. Please see below diagram for an illustration of the Yamaha & Honda connectors and the correct position the wires are suppose to be. Make sure your subharness is exactly like the diagram. If it is not you will need to swap the wires. Use a pin to assist you to release the wires from the connector and insert them into the correct position. I have installed the Sequential tail light as per the instructions and the park, brake, or signals do not work at all. What did I do wrong? Double check all the connections. Make sure there is good contact and that there is no exposed metal that could cause a short. 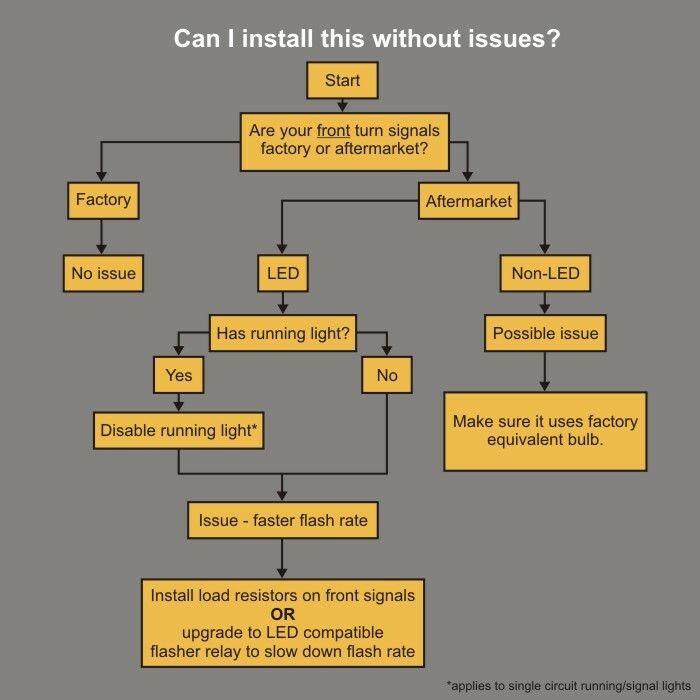 Make sure you are not running an aftermarket LED front park/turn signal combo light. If so, disable the park function and run it as a straight turn signal. If all connections seem good you need to isolate the problem. Remove the unit from the bike. Use a spare battery or 12V power supply and test all the connections. Test each function wire by wire. Black=Ground, Red=Park, White=Brake, Yellow=Right Signal, Blue=Left Signal. Once determined if the tail light is defective please contact us for warranty exchange. Please have your order number or auction number ready. If the tail light is functional, the problem lies within the sub harness or incompatible components on the bike itself. My motorcycle has hazard lights. Are the Motodynamic's sequential tail lights compatible with this function? Yes, the tail light is designed to blink once it gets the command from the bike. In some instances you may need to have the engine running to power up all turn signals at once if your battery is low. I noticed the Stop Alert for the brakes is activating on it's own while the engine is running and I am NOT engaging the brake lever. When the engine is off it does not happen. What could be wrong? This problem is common with older motorcycles or motorcycles with a lot of usage on the brakes. The hand or foot brake switch is the culprit and engine vibration is causing the contact points to go on and off triggering the brakes randomly. You can verify this by pulling out the brake fuse and see if the problem stops. I noticed the Stop Alert for the brakes is randomly activating while I am PRESSING and HOLDING the brakes while the engine is ON. It does not happen when the engine is off. What is the issue? Some Kawasaki, Yamaha and Ducati motorcycles experience this and it is caused by a voltage dropping issue. If it drops below the threshold to maintain a solid brake it will reset everytime. We developed a voltage stabilizer kit just for this reason and we started to included them in our tail light kits. If you ordered this tail light recently it should have been included, if not please provide us your order number we will ship it to you free of charge. How do I program the tail light functions? I noticed my brake light is on all the time? What could be the issue? This problem is caused by either a stuck brake switch either in the front handle bar or the rear brake pedal. Did you upgrade the front levers? Did you upgrade the rear brake set? Was the bike dropped or laid down on the right side? Was the bike serviced on the rear brakes? Does the rear brake pedal remain down after it is press and does not spring back up? If you answered yes to any of these questions, the brake switch could have been affected and will cause your brake lights to be constantly on all the time. For people who hard wired our tail ligths the brake light wire (white) could have been wired inversely with the running light wire (red), this also causes the brake light to be on all the time. A good rule to follow is to check that the front and rear brakes are functional prior to installing our light. My front brake lever activates the brake lights but the rear brake does not? What could be the issue? In few incidences you need to press the rear brake pedal harder to activate the rear brakes if the bike is not in motion. Other likely causes is the rear brake switch. Did you upgrade the rear brake set? Was the bike dropped or laid down on the right side? Was the bike serviced on the rear brakes? Does the rear brake pedal remain down after it is press and does not spring back up? If you answered yes to any of these questions, the brake switch could have been affected and will cause your brake lights to not activate when pressing the rear brake pedal. A good rule to follow is to check that the front and rear brakes are functional prior to installing our light.